The photo was shot at a lake and ASAP Ferg was covered in water and baby oil, said the photographer Renell Medrano. ASAP Ferg just released the cover for his new album, Always Strive and Prosper, and it’s absolutely beautiful. In a loose fitting white garment, he commands the image with his head slightly tilted back as he covers his eyes with his hands adorned in elegant diamond rings. It’s minimal, but as the light and water shimmer off of his polished skin, his melanated glow brings something spiritual to the black and white image. The captivating image was shot by the talented Renell Medrano, a Bronx-born photographer who’s shot crisp and candid photos of people like Justine Skye and Kylie Jenner. Her clean editing style had already been admired by Ferg who’d had some of Medrano’s images archived prior to the shoot for his album cover as well as the artwork for Ferg's single, "New Level." 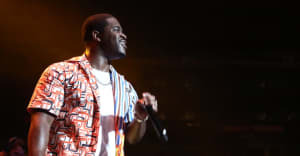 In a phone interview with The FADER, Medrano talked about how Ferg’s passion for art influenced the concept for the image and how it speaks to his rebirth. What was it like shooting the album cover? He’s actually a genius at what he does and he knows what he wants. We’d been shooting for a while like day to day and we couldn’t decide what we wanted to pick for the album cover so we sat down and just went through all the images and edited. Then we finally decided and it was like, “This is it!” It was exciting and he’s awesome to work with. You said he’s a genius. Is it because he’s into art? Yes. It’s funny because the way he came about me shooting his album cover is because he was a fan of my work and on his phone he had a bunch of images and references saved of my work and he just wanted something really clean. I definitely think him having a whole art background helps out a lot. You said you had a hard time coming up with what image would be “the one,” but from the beginning of the shoot what was the aesthetic that each of you wanted to go for? At first, we shot at a lake trying to do a baptism. We had shot before that too just trying to get the vibe and a feel from it to see what direction we’d ended up heading towards. We shot a couple other days, in the studio, outdoors and that image is actually shot outside at a lake. What I did was, I photographed it towards the light and basically he was the only thing popping up in the image. What about the lake is connected to the overall theme of the album? He’s always referred to as the "Trap Lord" and the "Hood Pope." So he wanted to go for like, the new Ferg. This is him being baptized and reborn. We were going for that feel, that’s what he wanted. He kept telling me that he wants his audience to feel that this a new Ferg. When you do hear the album, he talks about who he is, where he used to work at Ben & Jerry’s, his grandmother that passed away—it’s just pretty much everything. Was there a reason that you chose to stick with the black and white image? It’s simplicity seems connected to a rebirth. Exactly, right. It says a lot about rebirth. You see the jewelry on his hands and he’s also covering his face. That says a lot about it. The outfit that he was wearing was this long white shirt. When you get baptized, that’s what you wear. I love the way that his skin looks. There’s something metallic about it. That’s because he was dipped in water and we put baby oil all over him. He was in the water and we wanted it to stay so you could see the water on him. Did you two come up with this final image together?